TechniTrader Stock Trading Courses Instructor review - by Paul H. - "I have recommended your courses to dozens of my colleagues"
My name is Paul and I have been a TechniTrader Student for the last 6 years. I have ordered most of your (TechniTrader Elective Courses) productions over the years. I have recommended your courses to dozens of my colleagues. Martha, I will always be the student, study and re-study these courses. I think for myself and the "charts do not lie." Many thanks again. Go to the TechniTrader.com Learning Center and watch a wide variety of training webinars, to experience for yourself the excellence of TechniTrader education. TechniTrader Stock Trading Courses Instructor review - by Gordon E. - "You make sense." You are my all time favorite person to learn the market from. You (Martha Stokes CMT) are the only person to give me answers to all questions however trivial, and answers that make sense to me. I really appreciate it. No doubt, the media blows everything out of proportions. They call 3% catastrophic, yet when the market goes up 20% in a year, it is natural to them. Incredible. You make sense. I look forward to your two courses starting tomorrow. I have found that to become good enough at something, the knowledge must enter into the subconscious. Conscious knowledge is not sufficient. Here is one of my maxims: "one should not practice something until one gets it right." Instead, "one should practice until one can no longer get it wrong." This is the course Gordon E. is talking about, go read more about it HERE. TechniTrader Stock Trading Courses Instructor review - by Michael J.N. - "I can't tell you how much I enjoy taking the courses, as well as implementing the information I learn"
I can't tell you how much I enjoy taking the courses, as well as implementing the information I learn. You guys (TechniTrader Staff) are tremendous teachers and mentors. I have almost exactly one year of trading under my belt after spending about 5-8 hours a day studying the material from January through March while running my business. Though I am a novice, I am already flying solo and have confidence in my future. And thank you Martha (Martha Stokes CMT) for the encouragement of involving my wife - she is almost through the (TechniTrader Methodology Essentials Standard Course) ME10 Course and has already been a wonderful asset to my trading. By the way, the "Disciplined Trading and Investing Course" is excellent material and extremely timely. I look forward to continuing my training. This is the course Michael J.N. is talking about, go read more about it HERE. TechniTrader Stock Trading Courses Instructor review - by Roger M. - "You also share information that Bloomberg, Fox Business, and others never talk about. That's key." I just wanted to thank you again for all the work you have put into the courses, (Daily Market Educator Subscription Publication) DME’s, etc. I find that I think I know a lot, yet at the same time find that I know very little. The world of finance is so vast that it’s impossible to grasp. I have my trading account with TD, and they are trying to get me to use their tips, information, and other resources. I won’t even look at them. I told my wife that I have found someone in you that I have fully put my trust in and I am not going to sway from that. There is just too much deception in our world, and I truly believe that you are looking out for all of us students. You also share information that Bloomberg, Fox Business, and others never talk about. That’s key. I almost got sucked into the “Rich Dad Stock Trading” classes before I found TechniTrader. My gosh, I look back and am so glad that I didn’t do that. I have had to wonder at times how well they are trading. They are using MACD as their primary indicator. I used to think that was just the neatest thing. Just want to say thanks again. TechniTrader is "The Gold Standard in Stock Market Education." Go to the TechniTrader.com Learning Center to watch a variety of Webinars, and experience for yourself the excellence of TechniTrader education. TechniTrader Stock Trading Courses Instructor review - by Terry S. - "TechniTrader has been the Best thing that ever happened to me in Trading"
Just a short note Martha. Thanks for today’s (Daily Market Educator Subscription Publication) DME and all the Wonderful information you give to us your Students. It's appreciated more then you could ever know. TechniTrader has been the Best thing that ever happened to me in Trading. I have almost been in the Stock Market for 5 years now and have been with you ever since April 2008. What a Wild Ride it has been learning how to Trade the Market which I am finally starting to see the Light at the end of the Tunnel. I've made a Million - No Two Million Mistakes since I've been in but now have a Trading Plan and sticking with it, and its working slowly but at least no more One Step Forward and Ten Steps Back. I know that I would have had no chance of making it in the Market if I hadn't run into TechniTrader on the Internet. Sure glad I did all those searches and even came back to TechniTrader several times before making that call. Now for the first time since I started I'm starting to feel like a Real Trader and that I may be a pretty good one down the road. Anyway, enough talking. I just wanted to let you know that one of your Students really cares how much you put into your trying to teach us how to better our lives through Trading. So Thanks so Much and I Appreciate all you do for us. TechniTrader Stock Trading Courses Instructor review - by Michael D. - "both an excellent teacher and one of the most interesting and unique people I have ever encountered." Life presents very few moments, or moments one recognizes as life altering. However, I find myself encouraged and in the midst of what I hope to be a positive life altering year and transformation because of you and your TechniTrader team. After college I developed an interest in trading. During free time in my early 20’s I read books about the market, candlesticks, indicators, listened to webinars etc. but always felt that I was missing something, that I still did not possess enough cohesive knowledge to make a sound trading or investment decision. Up until that point I had still never made a trade before and did not know or understand how to approach the market. I just did not feel ready or prepared. The starting point of my transformation occurred about 8 months ago after listening to you teach on a recorded TC2000 Telechart Webinar. I remember throughout that webinar I did not understand much of what you were saying. You were speaking quickly because of the time constraints. Your vernacular was foreign and you spoke of the financial markets in a manner in which I had never heard before. However, afterwards I felt really excited. My gut and intuition were tugging me within telling me that I had just encountered someone special. Needless to say, my intuition was right and I have been one of your students ever since. My purpose for writing this letter is to say “Thank You!” I could write pages detailing the many reasons and person-life circumstances that contribute to my immense gratitude but that is for another time. In the meantime, I would like to thank you for all of your mentorship, hard work, and dedication to your students/me. Despite however never having met me I feel like you care about me and my success…almost as much as my parents. You are a special person and teacher. During my school years, I always struggled in math and required tutors to assist in my comprehension. Where my mind felt cluttered in trying to make sense of the problems, I would listen, amazed at how the tutor could dissect and simplify its complexity. After their explanation, and my own repetition, I could grasp the concepts. You possess that same type of genius and other intangibles that make you both an excellent teacher and one of the most interesting and unique people I have ever encountered. You are truly a treasure. I admire most your selfless dedication to passing the knowledge you spent your life acquiring to your students. It is my observation and humble opinion that in a capitalist society the most important security one could have is financial security. Therefore, there is no greater gift one could give another than the guidance, tools, and knowledge to achieve such security as well as thrive and reach ones fullest potential. You provide these tools every day by tirelessly working to impart your insight, approach, and knowledge so we too may achieve success in the financial markets. I am sincerely grateful. At this moment in time I am still at the paper trading stage of learning but am optimistic that through your teaching and my own efforts I too can one day become a disciplined and successful swing and position trader. During a commencement speech at Stanford, the late Steve Jobs made remarks centered around finding and doing what you love to do in life as one of the keys to success. He said, “If you haven’t found it yet, keep looking. Don’t settle. As with all matters of the heart, you’ll know it when you find it. And, like any great relationship, it just gets better and better as the years roll on.” Because of you and your continued guidance I believe I have found what I love to do in life. I also would like to thank your staff. Mele, Adrienne, Olga, and the others behind the scene. Their support, response times, and insight are greatly appreciated. At times I feel as if they are my co-workers, except friendlier and more responsive. Go to the TechniTrader Learning Center to watch a variety of Webinars, and experience for yourself the excellence of TechniTrader education. TechniTrader Stock Trading Courses Instructor review - by Cheryl M. - "so much passion for helping people to succeed"
Thanks Martha (Martha Stokes CMT) so much. It is such a blessings to have someone with so much passion for helping people to succeed in the trading world. Thanks for your simplified explanation. The money I have spent to be a part of the TechniTrader group is well worth it. TechniTrader Stock Trading Courses Instructor review - by Shabaz M. - "am extremely thankful in getting a chance to learn from Martha"
Kindly convey my VERY best regards to Martha (Martha Stokes CMT) for an excellent, excellent, fantastic write up on the RSI indicator. In recognition of true genius, Genius: 1% inspiration, 99% perspiration, who one crosses path with perhaps once in a lifetime. I humbly bow my head in respect and am extremely thankful in getting a chance to learn from Martha, the Wise Teacher and all of you. Thank ALL of you for your continued support and understanding. Sorry I was just overwhelmed and had to write a few words of my greatest appreciation! TechniTrader Trading Courses Instructor Martha Stokes CMT review - by Virginia S. - "I'm very grateful for your instruction"
First of all, thanks very much for your email; I had not expected that! I can't tell you how much I enjoy technical analysis and putting into practice what I've learned from you, Mele, Howard, and the (TechniTrader Methodology Essentials Standard) course I've taken. I seem to get something useful out of every (Daily Market Educator Subscription Publication) DME and the other posted comments/charts. And though I've only asked for one stock review, I will take your comment about requests to heart. I'm very grateful for your instruction and for how responsive the team at TechniTrader is, especially Mele. I'm happy to have this opportunity to let you know that directly. Thank you for taking the time to respond to me personally. 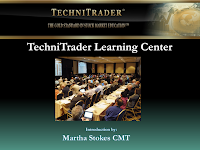 TechniTrader Trading Courses Instructor Martha Stokes CMT review - by Del B. - "Never would have been this successful without you"
Never would have been this successful without you, Martha (Martha Stokes CMT) and the (TechniTrader) team.